Welcome home! Don’t miss your chance to own a single family home in a great location. This awesome all brick ranch has 3 bedrooms, 2 bathrooms and a spacious family room. The main floor has hardwood floors and the kitchen has been updated with recently installed vinyl plank flooring. There is a large family space in the basement and a 3/4 bathroom. The large backyard has a covered patio and a shed to store your gardening tools. There is a one car attached garage. 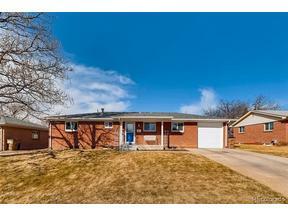 This home is close to everything, shopping, dining, Boulder and Denver.